An eclipse of the moon happens when the Earth passes between the sun and the moon. The Earth throws a shadow across the moon as it blocks the sun’s light, causing a “lunar eclipse”. If the Earth’s shadow completely blocks the sun’s light, it’s called a total lunar eclipse. These images show the changes as the moon goes completely behind the Earth. But there are a couple of other things that will make this eclipse special. For one, it’s a “supermoon”. Because the moon travels around the Earth in an oval path, sometimes the moon is closer to Earth, and sometimes it is farther. When the moon is at its closest, it’s called a supermoon, because it’s brighter and appears larger than normal. The moon travels around the Earth in an oval path. When the moon is at its closest (called “perigee”, left) it is brighter and appears larger than normal. 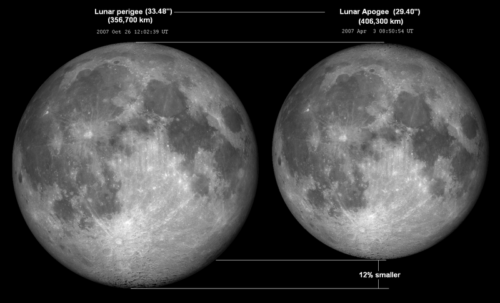 “Apogee” (right) is when the moon is farthest from Earth. But this eclipse will not only have a supermoon, the moon will also appear to turn red. This is called a “blood moon”. The reason the moon turns red is because of the way light bends around the Earth. The Earth has a layer of gases around it called the “atmosphere”. The atmosphere is like the Earth’s invisible blanket. It protects us from being hurt by the sun and it traps the heat, keeping the Earth’s temperature stable. The total lunar eclipse on January 20-21 will be a “super blood moon” This picture of a blood moon was taken during a lunar eclipse in 2014. The Earth’s atmosphere can change the way light looks by coloring or bending the light. The atmosphere is not clear. It’s colored by things like pollution, dust, smoke from fires, and ash from volcanoes. If you’ve ever seen an amazing sunset, then you’ve seen how the atmosphere can color the light. If the sun looked big during the sunset, it may have been the atmosphere bending and magnifying the light. Blood moons are caused by the Earth’s atmosphere, which can bend and color the sun’s light. So when the Earth blocks the sun’s light during a total eclipse, some of that light passes through the Earth’s atmosphere. When it does, the light gets colored. It also gets bent, or “refracted” so that it shines on the moon. 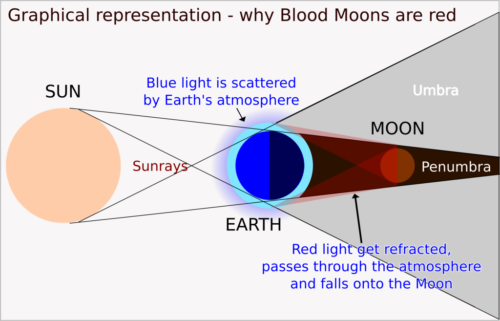 That is why the moon can look red during a blood moon, even though the Earth is blocking the sun. People in North and South America and parts of Europe and Africa should have plenty of time to see the eclipse. From beginning to end, the eclipse will last about three hours. The “totality” – when the moon is completely blocked by the Earth’s shadow – will last 62 minutes. There is no danger from watching a lunar eclipse, and nothing special is needed to view it. 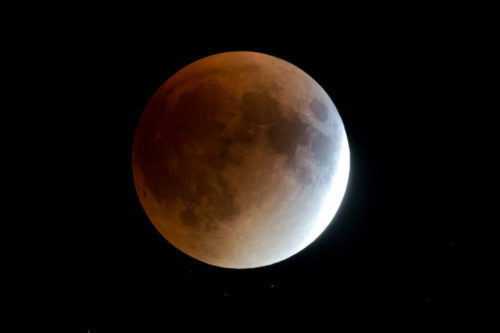 The lunar eclipse will be visible in North and South America and parts of Europe and Africa. The next full eclipse of the moon won’t happen until May 26, 2021. 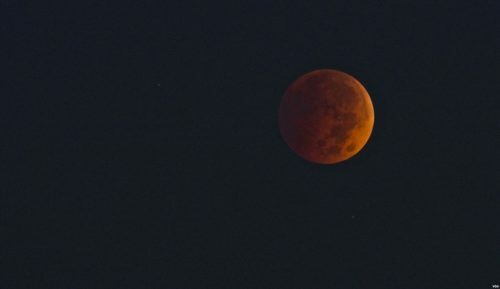 The website TimeAndDate.com has a special page that can help you find the time of the eclipse in your area. The site will also have a live video of the eclipse, if you can’t see it where you live. The Griffith Observatory in California also plans to stream the eclipse live. The next full eclipse of the moon won’t happen until May 26, 2021. That eclipse will be mainly visible in Europe and Africa.